In all programs, campers will spend most of their week led by a staff instructor in small peer groups of similar ages (see below for our programs by age). Each day begins with a morning welcome as a large group, before breaking into smaller peer groups for hikes, team building, lunch, snacks, and field studies. Weekly events like a day in our meadow, testing the health of our creek, and choosing a banana slug to compete in an epic race all build tradition while campers are immersed in weekly themes that rotate throughout each season. One of our favorite activities for all camps, and longest camp traditions, is fort building. During fort building, campers are encouraged to self-direct their play, creating space for community building, creativity, and independent exploration. Many of our forts have been built by generations of campers over the years, so your campers can visit ‘their’ forts again and again as they move through our programs. Our Instructors are dedicated, qualified, and deeply committed to providing a high-quality experience for each child, working with youth volunteer Counselors to run their groups each week. Both Instructors and Counselors often return year after year, creating a consistency that can be hard to come by in seasonal programming. Nature names used by staff and volunteers bring a sense of magic and wonder to our camps, often inspiring campers to create their own nature names that can follow them for years to come. Half Day: Campers aged 4 to 6 (or grades K— 1st) are placed into one of three age/grade appropriate group of up to nine peers from 9:00 am to 1:00 pm. 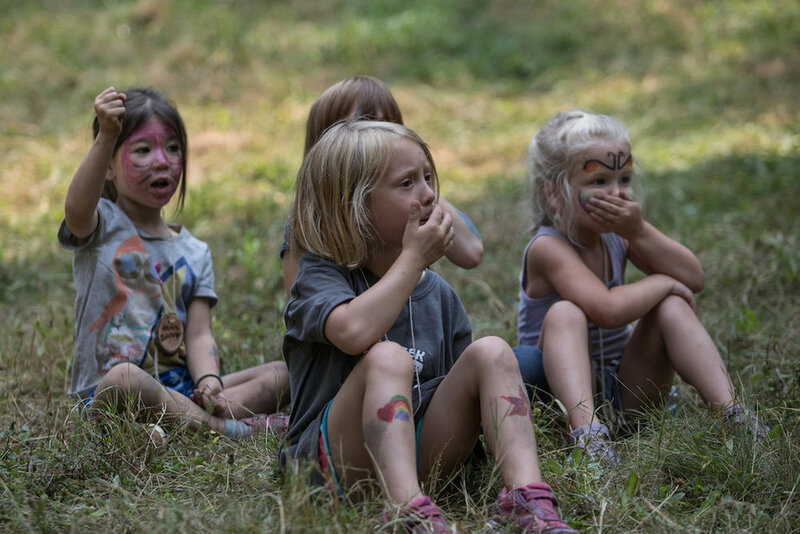 Our three half day Instructors are skilled early childhood educators and all camps themes are focused on encouraging sensory exploration, helping campers discover the magic of the forest through short hikes, crafts, games, songs, meadow exploration, and more. Full Day: Campers ages 6 to 12 (or grades 1st—6th) are placed into one of five age/grade appropriate group of up to 12 peers from 9:00 am to 3:00 pm. Five talented full day instructors lead these groups in songs and games, hikes to visit bridges, creek data collecting, sharing stories, and learning more about our forest ecosystem. Afternoons are spent in mixed-age groups doing self-selected activities like crafts, games, fort building, scientific exploration, and team building. These afternoon activities are a chance for campers to explore personal interests, meet new people, or spend time with friends or family members in different groups. Wilderness Explorers Camp Program: Our new Wilderness Explorers program is perfect for your emerging outdoor enthusiast. This program is designed for campers aged 11 to 14 (or grades 6th—9th) that are interested in gaining in-depth knowledge about themselves and the natural world through developing stronger nature exploration skills. Using advanced programming, longer hikes, ecological activities, and inquiry-based dialogue, these camps will focus on interpreting place-based information through identifying environmental clues and signs. Campers will learn to hone their skills of observation and analysis, and come to trust that their senses are capable of producing real-time data that is more accurate than the generalities found on digital devices! Wilderness Explorers will have fun through engaging activities to help campers rediscover the lost art of reading nature clues while fostering a camper’s self-reliance, leadership skills, and ecological stewardship. 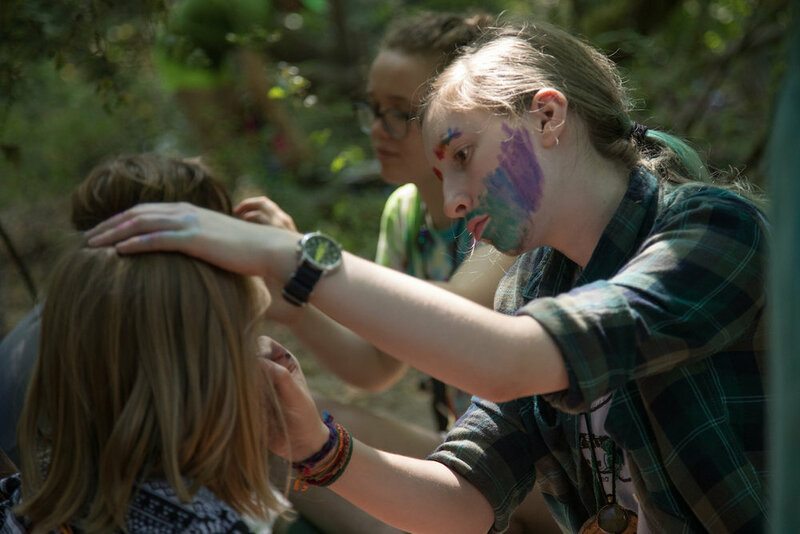 Counselor in Training (CIT): This program invites campers aged 11 to 14 (or grades 6th—9th) to begin the transition into our high-school aged volunteer program. CITs work with their Instructor and a skilled Intern as a group of up to twelve to learn leadership skills, build community, and get to know our unique urban forest in a new way. Longer hikes and in-depth ecological explorations keep camp traditions alive, while activities with both half and full day camp groups build skills in leadership and teamwork. Volunteer Counselors: Youth aged 15 to 18 are invited to apply to volunteer for up to 4 weeks each summer with our full day and/or half day camp programs. Counselors work closely with our seasonal staff Instructors to collaboratively lead groups of campers during songs, games, hikes, and activities. Each week, Counselors are given time to set goals and reflect on their experiences, working closely with staff to develop as leaders, educators, students, mentors, and friends. Participation in the CIT program is not required to volunteer as a Counselor, but previous CIT participants are welcome to begin volunteer starting at age 14 rather than 15. This a fee free program. COUNSELOR APPLICATIONS are now open! Click the appropriate link below to get started. Spring Break Camp: Registration OPEN! Inservice Day Camp: Registration OPEN!